Kitchen vent installation is another service Dryer vent cleaner offers. Many customers came to us after not being able to find a company that would install their kitchen hood exhaust vent. The picture above was in a home that for 9 years they were running the fan into the cupboard. The reason they could not find someone to install the kitchen vent could have had something to do with the fact it was 16 feet up on the side of the house due to a walkout basement! Kitchen vent installation will ensure your kitchens greasy, smelly and sometimes burnt smell are properly vented outside. 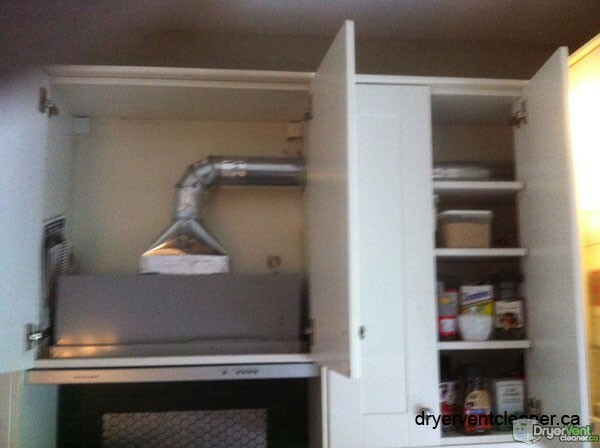 It is important that the right size ductwork is used to ensure proper running of your range hood. The size of kitchen exhaust ductwork it determined by the manufacturer of your exhaust fan. Below are rough guidelines to the best size to use. Here are some guidelines to follow based on your Range Hood or Vent Hood CFM.